BY WINTZENHEIM (68) OR HUSSEREN LES CHÂTEAUX (ROUTE DES CINQ CHÂTEAUX). MANY TRAILS cross the forest area AT DEPARTURE FROM THE picturesque cities surrounding castle. REACH THE CASTLE BY GR 532 TRAIL (1 hour to 1,5 hour walk) from ST GILLES, close to the agricultural highschool. IS IT POSSIBLE TO ARRIVE IN ST GILLES BY TRAIN (COLMAR-METZERAL LINE) OR BY BUS (BUS LINE 5). 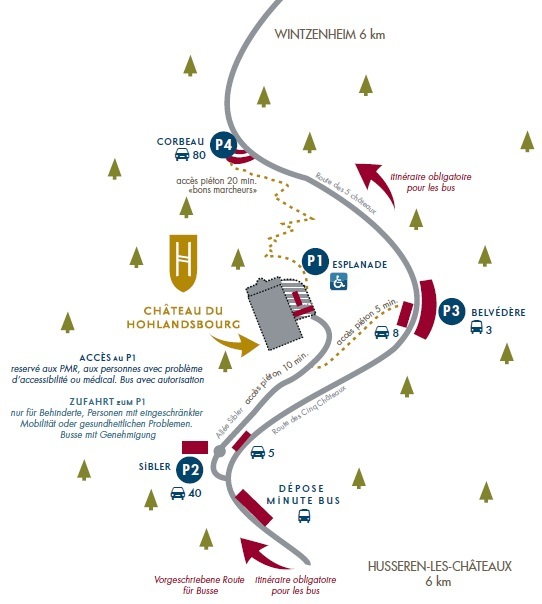 TAKE THE SQUIRREL TRAIL, FROM "TROIS CHÂTEAUX" PARKING, above HUSSEREN-LES-CHÂTEAUX, to HOHLANDSBOURG's parking and Find explanatory signs about local wildlife and flora along THIS easy 3,2 km PATH. 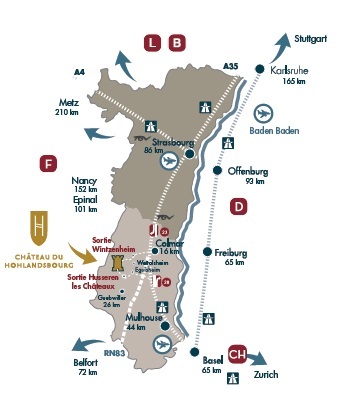 ALSO JOIN US FROM WETTOLSHEIM AND the "CHÂTEAU DU HAGUENECK" OR FROM EGUISHEIM AND "LES TROIS CHÂTEAUX".